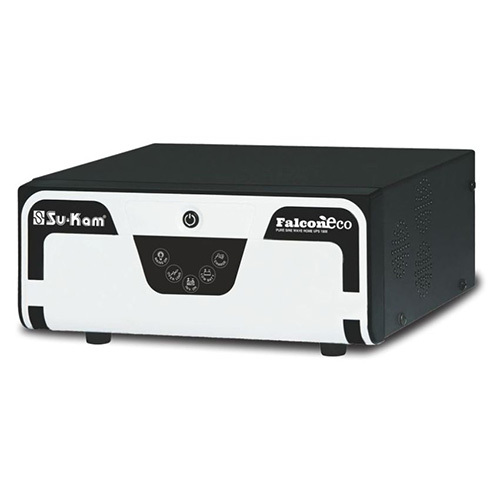 The Su-Kam Falcon ECO 1000 is a Sine Wave UPS built with revolutionary technology for 24x7 appliances protection. It is designed with Su-Kam patented Fuzzy Logic Controlled Patented Technology, automatic overload sensors and works in the background without any knowledge. System handles current up to 300% of its actual capacity. Uses HCLC technology for constant and complete protection to appliances, especially in times of irregular current supply. System is equipped with SMPS-based charger, minimizing power requirement and consumption. Choice present between UPS mode and Wide UPS mode. Option to choose and switch between battery types and charging points. Uses patented Fuzzy Logic Controlled Patented Technology to control battery charging process. Switchover between mains and battery power is effortless. Available with either Chetak or Knight wheeled trolleys, the Su-Kam Shiny UPS makes an interesting addition to any modern home. The Falcon ECO 1000 can handle PC, TV, room cooler, tube light, fans and CFL smoothly.